India successfully test-fired nuclear capable surface-to-surface short-range ballistic missile (SRBM) Agni-I from a defence test facility off Odisha coast for an extended range. The missile was launched from a road-mobile launcher placed at the launching complex-IV located in Abdul Kalam Island. Two weeks earlier, longest range Inter-Continental Range Ballistic Missile (ICBM) Agni-V was tested from the same test facility. The test for Agni I was conducted by the Strategic Forces Command (SFC) of Indian Army with logistic support from the Defence Research and Development Organisation (DRDO) for a range of about 900 km. The last trial of the missile was successfully conducted on November 22, 2016, from the same base. The missile was inducted into service in 2004 and it was the 18th version of Agni-I. Agni I is a surface-to-surface, single stage missile which is powered by solid propellants. The missile is 15-metre-long Agni-I, weighs 12 tonnes and can carry payloads up to 1,000 kg. It was launched as part of a regular training exercise by the armed forces. It is an indigenously developed short-range nuclear-capable ballistic missile with a strike range of over 700 km. The missile has a specialised navigation system, which ensures it reaches the target with a high degree of accuracy and precision. The missile is also capable of carrying nuclear warheads. 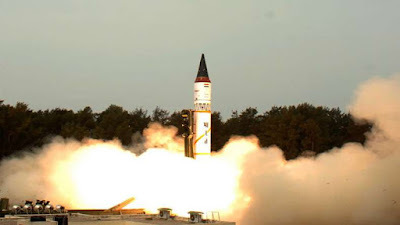 It is a single-stage missile which was developed after the Kargil War in order to get a better missile as compared to the 250 km range Prithvi-II and 2,500 km range Agni-II missiles. The Agni-I was developed by the Advanced Systems Laboratory or ASL (a premier missile development laboratory of the DRDO) in collaboration with the Defence Research Development Laboratory (DRDL) and the Research Centre Imarat (RCI). The missile was integrated by the Bharat Dynamics Limited, Hyderabad.